I argued in 110 pages that US Economic growth is not as reported because the GDP formula is both archaic and misleading. I recently posted at MATASII.com on September 29, 2017 an article entitled “An Archaic GDP Formula Hides the Fact the USA is Already in a Depression!“, that gave an additional perspective on my views. The central issue is, do you consider debt as income? I do not! 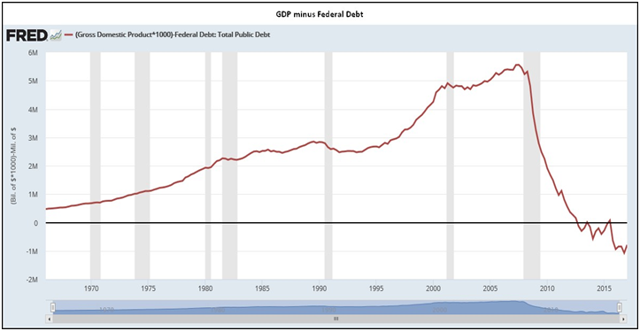 As a consequence, if you acknowledge for the sake of argument that government debt is not actual national income, the following graph is how the U.S. economy looks like excluding stimulus. This is Actual GDP excluding artificial stimulus. The US is in actual fact in an economic depression. Only a flawed perspective shields us from the startling reality.